Udupi, June 16, 2015: The district committee of the CPI - Communist Party of India (Marxist) was critical of the State Congress government for inaugurating the first phase of the Varahi Irrigation Project in a hasty manner even before the works were completed. The first phase of the project, constructed at a cost of Rs. 600.33 crore, was inaugurated by Chief Minister Siddaramaiah at Holeshankarnayana in Udupi district on May 4, about 35 years after the foundation stone was laid. In a press release issued here on Monday, Balakrishna Shetty, district secretary, CPI(M), said the Congress government had claimed credit for getting the first phase work of the project completed. The fact is that water has never flowed in its canal since the irrigation project was inaugurated. The monsoon has now started, the farmers will forget. But it is up to the State government to get the work completed soon. Otherwise, the CPI(M) would launch an agitation. The government should also complete the second phase of the project within a time-frame. 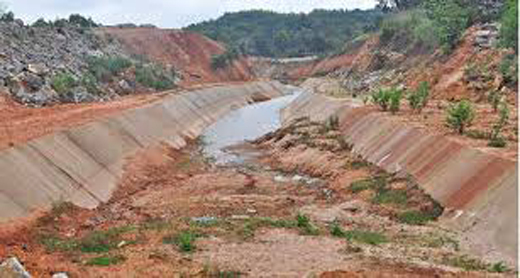 Further, R. Nataraju, Chief Engineer of the project, told media that water was not being released now in the canal as the monsoon had hit the district. Farmers did not want the water to be released. The CE said that for the first 10 days after CM Siddaramaiah inaugurated the work, water was being released till 30th km of the Left Bank Canal. However, after that water was released only till the 23rd km. While the earth works had been completed till the 30th km, the concrete lining work had been completed till the 23rd km. The monsoon has begun so the concrete lining work could be done it will re-start in November 2015.